Nothing is tastier at a cocktail party than great finger foods and cold cocktails. 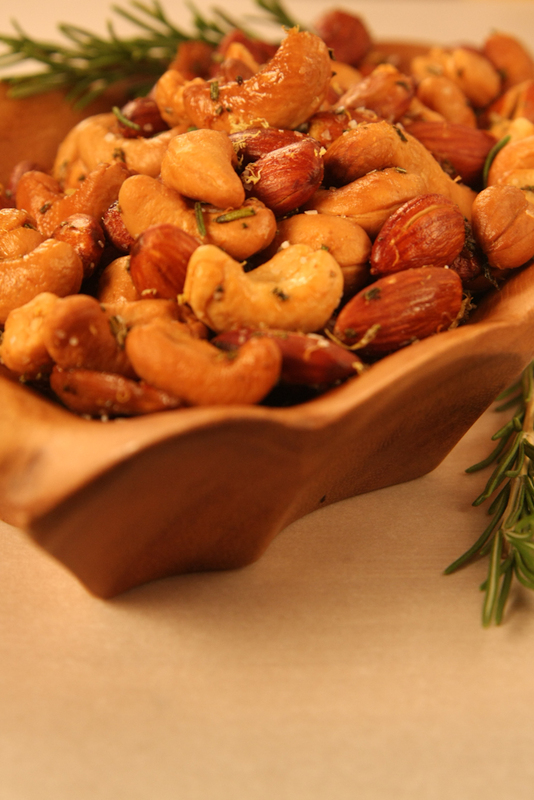 A big bowl of roasted nuts are the perfect do-ahead, easy appetizer for entertaining. When hosting a party, give yourself a break and choose menu items that can be prepared ahead of time. You will thank yourself when you aren’t running around in the kitchen, but instead, enjoying your guests. 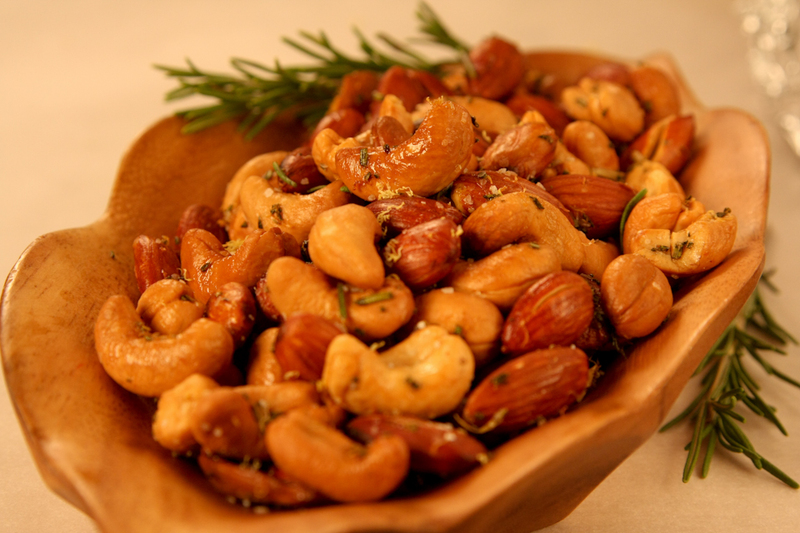 These roasted nuts have a gourmet flavor but are very simple to prepare. They have a salty, lemony, addictive taste that your guests will leave your guests begging for the recipe. This appetizer would pair nicely with sliced apples and a wedge of blue cheese. Another great accompaniment would be a jar or prepared roasted red peppers, crackers, and an herbed log of goat cheese. Caramelized onions with toasty bread always seem to be a crowd pleaser, and also can be served at room temperature. A successful party is in the details. A simple bowl of roasted nuts served in a beautiful Acacia bowl is what I call, elegant, easy entertaining. Another suggestion would be to serve the nuts in a (name of platter with 3 parts) next to marinated olives, and cheese cubes. With beautiful serving ware in your pantry the combinations are endless. After years of catering and event planning with a lot of fancy equipment and dishes galore, I now enjoy having just a handful of my Acacia wood neutral bowls and platters to make my own parties a success. For this recipe I used, my small Mason Cash mixing bowl and served the nuts in the trendy Pacific Merchants Acaciaware® condiment bowl, with lemon and rosemary for garnish. Roasted nuts pair nicely with Sauvignon Blanc, Riesling, and my favorite -Champagne. Line a baking sheet with parchment paper or foil. In a small sauté pan melt the butter and warm the olive oil. Add in the lemon zest and rosemary, and stir to combine. Place the nuts in a small Mason Cash mixing bowl, and pour the butter mixture over the top. Stir to combine the nuts with the butter and olive oil mixture, and sprinkle. Lay the nuts out evenly onto a lined baking sheet sprinkle with the sea salt. Roast in the oven for 15-20 minutes, stirring half way through the cooking process. The nuts will become aromatic and golden brown when done. This entry was posted on Tuesday, November 27th, 2012 at 3:13 pm and is filed under General. You can follow any responses to this entry through the RSS 2.0 feed. Both comments and pings are currently closed.